In a typical current Ethernet installation cables will run from each of the network points in an office, building or even (small) organisation to a central point where they all can be connected. In a very small installation this central point may consist of a switch or, in years gone by, a hub. However, the moment the installation becomes somewhat bigger all these cables will converge at a patch panel. A patch panel simply consists of a series of (RJ-45) sockets to which cables may be attached from the rear. 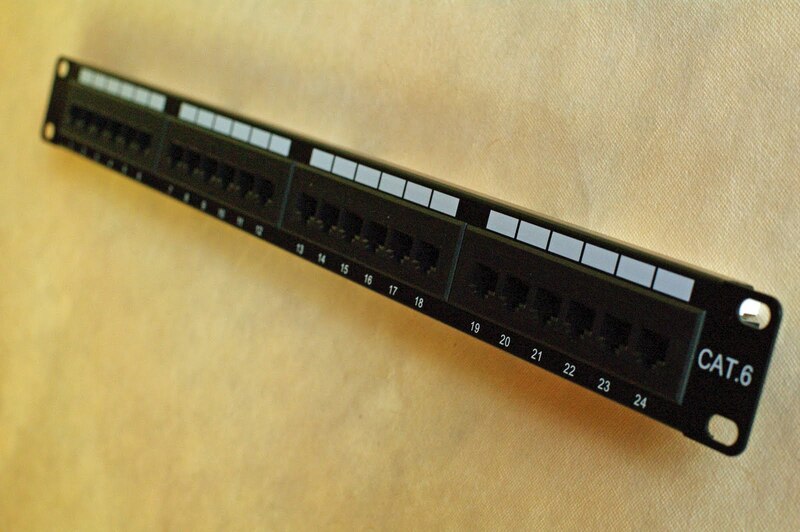 A 24-port patch panel is depicted below. At the rear one finds the typical slots in to which wires may be pushed down. In this case the colour coding makes provision for both T568A and T568B as explained in an earlier post on UTP cable. 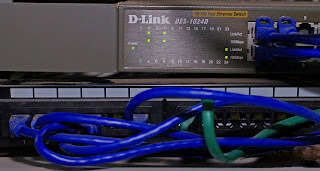 After installation the network points may be connected with a switch, hub, or other device using patch cables. In the picture below the patch panel is on the bottom and blue and green patch cables are used to connect points to the switch at the top.